Nothing screams SUMMERTIME more than juicy strawberries. We tried to grow them in our garden this year but for some reason they were lazy and didn't give us many berries. I will say when I see a strawberry I can immediately feel my insides quenching. Plus who doesn't LOVE them! 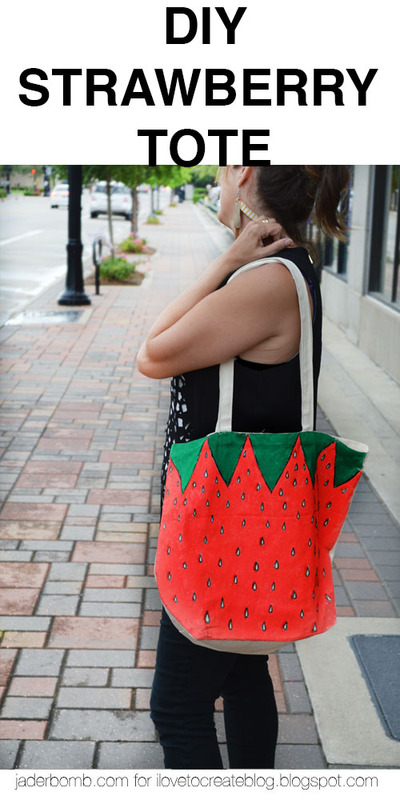 I wanted to make a strawberry bag that I can bring with me everywhere and catch everyones attention! I think this bag will do it, what about you! Did I mention this is a GREAT craft for kids! Step One: Grab your black electric neon marker. Step Two: Draw triangles along the top of the bag. I love this shade of fabric paint. It's called Tomato and it looks very juicy! Step Three: Draw little tear drops all over the bottom portion of the bag. I drew more towards the top of the bag then made them bigger and more spaced apart towards the bottom. Step Four: Before you start painting place some newsprint in the bag. This will prevent it from bleeding through to the other side. Step Five: Grab your brush and start filling in the entire bottom section with the red paint. Carefully go around the seeds. It's so pretty when it's complete! It reminds me of a tomato right now! Step Six: Get your green paint and start filling in the top parts. Make sure to put a good coat so it covers the bag good. This is what it will look like when you are finished with the green. When you are finished let it sit for about 30 minutes to dry. Step Seven: Get your black fabric marker out and go over all the lines you previously put down. These markers are great for outlining due to the fine brush tip. Step Eight: Get your neon green marker and shade around the edges of the painted green. Step Nine: Get your red fabric marker and add some marks around the seeds. This will just add a shadow. Make sure to check out my post on how to make Shibori Towels.